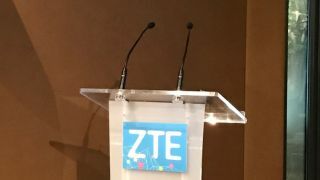 It all started so well: “We’re very proud to announce the first 5G phone,” said ZTE to the assembled journalists, “the ZTE Gigabit”. A real landmark, you might think. A company best known for its mid-range offerings and a marginally under-appreciated but largely unremarkable Axon flagship range, rolling out a new superphone at MWC 2017 that would put even the likes of Samsung and Apple in the shade. The assembled journalists shuffled in their seats and craned their necks for a view of this phone. The vast majority of us had already had the ‘fastest ever phone’ news, under embargo, and were now waiting for our first glimpse of the handset itself. But nothing to show yet. No phone in ZTE man's hand. No cringey lifestyle photo on the presentation of someone checking their phone out while skateboarding through a picturesque and demographically cosmopolitan generic European city. No. Not yet. First some slides on the technology – how 5G would revolutionise human communications, facilitate live VR 4K streaming, download a Tidal track in seconds. How this could bring 'emotion engines’ and AI capability to our handsets. How at some point ZTE would roll some of this technology into its flagship Axon range. Rumor has it that the Gigabit phone on show at the ZTE stand in Barcelona’s MWC will constitute a screen that shows how fast the phone is. You can’t use it to make calls, and it won’t be running a new version of Android or showcase a design. It will be a screen, attached to some (admittedly cutting-edge) circuit boards, including the latest Snapdragon 835 offering, showing that 5G is, unsurprisingly, really, really fast. It’s easy to mock. Admittedly, if the circuit boards can fit in a phone chassis and do indeed prove that what they’re calling 'pre 5G' can help us all into a new era then it’s not an insignificant achievement. I’d just contend that it doesn’t really qualify as a phone. Yes, you could argue that the box-free Raspberry Pi is still a computer. But calling a device that doesn’t really operate very much like a phone, that’s not going to ever be sold to a consumer, and that a company couldn’t even hold up in front of journalists a phone is a bit of a reach. I’d have taken a phone that was being released in six months and was still duct-taped together. I’d have even grudgingly accepted a completed concept phone that was never going on sale. But I’m afraid the ZTE Gigabit does’t qualify as the world’s fastest phone… based on the fact that it’s not a phone. It’s the world’s fastest grouping of phone technologies soldered together and left out of a case. Which is not nearly as good a headline.